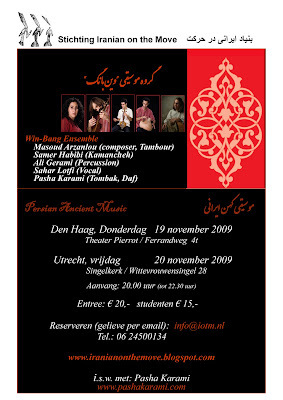 Win-Bang Ensemble (formerly named GHOGHNOOS) founded by Masoud Arzanlou in 1989, in order to promote mystical music that emanate from ancient Persian music. Masoud Arzanlou has been a composer, conductor, and music instructor since 1989. He is one of the masters of Persian mystical musician and vocalist. Win-Bang Ensemble is a collective of Persian musicians and vocalist. Each Ensemble member's illustrates a unique performing while maintaining the integrity of art rooted in an authentic tradition. Ensemble artists have collaborated on a diverse range of musical innovative performances that explore the relationship between tradition and innovation in music. TAMBOUR is the main instrument and KAMANCHEH, BARBAT & PERCUSSION are the supplementary instruments. Tambour as one of the Persian cultural heritage has over five thousands years' written history. Win-Bang Ensemble has been performed in many Ancient Persian, Traditional, Sufi & Kurdish Concert, festivals & workshop around the world. Introducing Persian traditional and ancient music to the aspiring audiences from different nationalities whether in east or west is the primarily motivations of Win-Bang Ensemble.